This diverse artist works in a handful of mediums, from painting and graphic print, to jewellery and sculpture, from weaving and ceramics, to installations and photography. Gogi’s creativity is shaped by her life and cultural identity, by her inner and outer world. She wants her work to be reflective of the times in which she lives in, leaving behind a legacy, a visual narrative that can be referred to in the future. 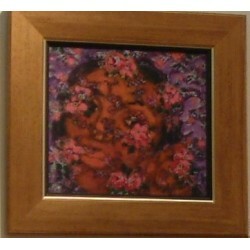 She often portrays women in her work, reflecting their roles and experiences in society. Gogi was born in 1945 in Neoli, Uttar Pradesh and attended the College of Art in Vanasthali in Rajasthan followed by the Government College of Arts and Crafts in Lucknow. 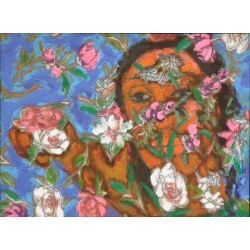 She was also a vocational student for a Painting postgraduate at New Delhi’s College of Art. 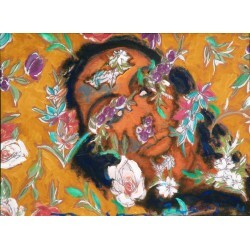 Some of the exhibitions she’s held include: ‘All These Flowers Are For You’ - a solo which took place at the Tao Art Gallery in Mumbai and the London Art Gallery in London; ‘Women Artists’ - a solo at the National Gallery of Modern Art in New Delhi; and ‘Kali’ - a group showing at the Tropical Museum in Amsterdam.